Since the beginning of 2012, we have seen the word Libor in newspaper headlines almost every day. The scandal surrounding the London Interbank Offered Rate (LIBOR)—the inter-bank lending rate—involved a series of fraudulent actions that resulted in numerous investigations. It will lead to a substantial change in the financial system, and has been one of the biggest issues so far this year. I am very sure that there is a feng shui connection. According to the Chinese horoscope, every year has five elements: water, wood, fire, earth and metal. In addition, each year has an animal zodiac symbol, for a cycle of 12 animals: the rat, ox, tiger, rabbit, dragon, snake, horse, sheep, monkey, rooster, dog and boar. This year is the year of the water dragon. Each animal and element has different characteristics, and it is said that the year of the dragon always brings most change. The dragon is the celestial creature of the spring season. A year ruled by the dragon is always a time when the world experiences new beginnings. The water element symbolises money, so it is no wonder we are facing a big financial scandal. I revealed this in my talk on New Year predictions (given in Tokyo on 17 December, 2011), and what I said has come true. The year 1988 was that of the fire dragon and, since fire symbolises power, we saw a major change in the balance of political power in the world. This year, former Soviet statesman Mikhail Gorbachev launched a radical reform strategy for the Soviet Union at the Communist Party conference. In Japan, restructuring (or perestroika, the term introduced by Gorbachev in the context of the Soviet Union’s foreign economic sector) was selected as the top buzzword of the year and received the U-Can Ryukogo Taisho prize from U-can Inc., an education and support firm. The year 2000 was that of the metal dragon, and with it came the IT revolution. High specification–low price computers, routers and broadband internet access rapidly grew in popularity, bringing change and new economic growth. IT revolution was Japan’s top buzzword that year. We are currently in a year of change. Many national leaders and firms in various countries are changing. This is an election year in many First-World countries and, from a feng shui perspective, leaders are in danger. 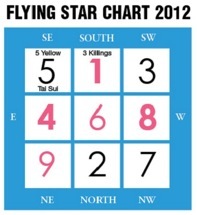 North-west, the compass direction of the leader, is affected by the number seven star and indicates loss, robbery and betrayal. Not only presidents, but also managers and fathers are at high risk of being cheated, betrayed or experiencing loss. In a worst-case scenario, a leader should resign and so not lose their reputation, as was the case at Barclays Bank PLC., Yahoo! Inc. and Best Buy. 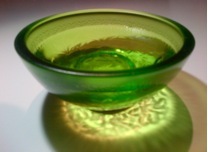 • Place a bowl of water in the north-west part of your office. • Or place a figurine of a blue rhinoceros in the north-west and leave it there until 3 February 2013. As the number seven star is a metal element, water can suppress the problematic energy. Also please ensure that the water is still and not flowing, as it does in an aquarium or fountain. As the north-west is also the direction of metal, the effect of the distress is very strong in 2012. We need to protect ourselves so we can enjoy our careers by riding the water dragon.